pebbles in the mosaic of one global power. May God save the world." The TPP did not float to the shores of Australia in a sealed bottle. It has been many years in the making. It is part of a wider plan never discussed in our media. Australia's participation in the TPP is a small part of a geopolitical power play by the US and its largest corporations. This powerplay has two major components. One is economic and the other is political/military. How does the TPP in Australia fit into the massive changes taking place in the world economy? How do thiese changes fit into the international political and military situation? Who is in the TPP? Who is Not in the TPP? The TPP is not just a local imposition on our sovereginty and legal system. The negotiations on what became the TPP began in 2005. (1) The main nasty element of the TPP, the Investor-State Dispute Settlement system, was developed in the late 1980s. (2) The TPP covers 12 contries which border on the Pacific: Australia, Brunei, Canada, Chile, Japan, Malaysia, Mexico, New Zealand, Peru, Singapore, the United States, and Vietnam. Unlike standard bilateral trade agreements, the TPP is a one size fits all treatey carefully designed by 600 of the largest and most powerful corporations in the world. It is forced on the politicians of the different countries, not negotiated by them. The TPP does not include any of the Asian Tigers in our region. It does not include China, which has the second largest economy in the world as measured by its Gross Domestic Product.(GDP). Nor does it include important South East Asian countries like Indonesia - 9th largest GDP, South Korea - 11th, Taiwan - 21st, or Thailand - 22nd. The table below shows the GDP rank of the countries involved in the TPP. (3) Slightly more than half of them rank lower than these important Asian economies. What the 11 countries joining with the US in the TPP have in common is that they are politically very close to the US. Are these 11 countries in the TPP simply because they are client states of the US and prepared to accept the dictates of the the US corporations? And There is More - the TTIP! The TPP is not a one-off. There is another TPP clone being negotiated between the US and the EU called the Transatlantic Trade and Investment Partnership (TTIP). It developed out of three important groups. In 1995, a pressure group of business people was founded. Later the Transatlantic Business Dialogue (TABD) was set up by public authorities on both sides of the Atlantic. In turn this led, in 1998, to the creation of an advisory committee, the Transatlantic Economic Partnership. (4) Finally negotiations got serious about 2013 and it is supposed to be finalized this year. The TTIP covers the US and 28 countries. (5) Three European countries are missing: Iceland, Switzerland and Norway. One might also wonder where Israel fits into this global economic picture. Israel's rank of 54 puts it between Portugal - 53rd and Morocco - 55th. In terms of its economic weight, Israel is clearly a lightweight. Really it is a US funded garrison state in the Middle East. It has political and military influence far above its lowly position in the world economic system. In economic terms it is outranked by the following Middle Eastern countries: Saudi Arabia - 14th, Turkey - 17th, Iran - 18th, Egypt - 24th, the United Arab Emirates - 32th, Algeria - 34th, Iraq - 35th, Qatar - 49th and Kuwait - 52th. If there ever was an national mouse that roared, it is Israel. Outside of the TPP/TTIP trade block several countries are coming together to create a new economic world order. In reality this is a direct challenge to the TPP/TTIP trade block because they want to do things very differently. Their goal is to replace the current system controlled by the International Monetary Fund (IMF) and the World Bank, which in turn are directed by the international 1% in the US and the EU. One of their main goals is to use local currencies rather than the US dollar for imports and exports. The most prominent countries working on this project are Russia and China. The media, our government and all major political parties in Australia are silent about these new and quite public plans. The most prominent countries leading this movement are called the BRICS (Brazil, Russia, India, China, and South Africa). The BRICS countries also play a role in the Shanghai Cooperation Organization (SCO), the Asian counterweight to NATO. The SCO is made up of China, Kazakhstan, Kyrgyzstan, Russia, Tajikistan, India, Mongolia, Iran, and Pakistan. It is useful to look at the GDP of the BRICS countries and compare them with some of the major EU countries. As we have seen China is ranked 2nd. India is 3rd. Russia - 6th, Brazil - 7th, and South Africa is 29th. By comparison, Germany at 5th is below China and India. France at 8th is below Russia and Brazil. The UK, at 10th, is just below Indonesia at 9th, and just above Mexico. Thus of the top 10 countries ranked by GDP, four of them are in the BRICS, five of them are in the TTP/TTIP block. The only "non-alaigned" country in the top 10 is Indonesia. Notice that the BRICS countries are not economic lightweights, and to think of them as "underdeveloped" is to miss the point. In economic terms they are right up there with the Big Boys of the West. Further, if you think about the aggressive and antagonistic attitude of Prime Minister Abbott toward Indonesia, it is interesting to realize that ranked in terms of its GDP, it is easily on a par with his native UK. He is certainly not thinking about Australia's economic and political future in Asia. The following table highlights an interesting fact about a difference between the major Western countries in the TPP/TTIP trade agreements and the major BRICS countries. (6) All of the major Western countries in the TPP/TTIP agreements have a greater government debt to GDP ratio than any of the BRICS countries. Note also that Australia's debt to GDP ratio is at the lower end of the percentages for the BRICS countries. While the Liberal/National Coalition talks of Australia's level of government debt as if it was a sign of gross economic mismanagement - and Labor does not seem to dispute this - Australia's debt level is relatively low by world standards. It looks much better than the debt ratios of the large Western countries who run the IMF. Do they practice what they preach? It seems the LNP Coalition are just playing politics. What do the BRICS Countries Want? The BRICS have at least two important economic goals. One is to replace the US dollar as the medium of trade between countries. Since WW II most trade has been valued in terms of US dollars, and countries who want to buy commodities like oil need to hold US dollars to pay for their purchases. This practice gives the US great power in the world economy since its dollars are necessary for trade to take place. If the BRICS can remove the power of the US dollar they can "de-Americanize" the world. The BRICS countries want to trade in local currencies, thereby avoiding the need to buy US dollars. 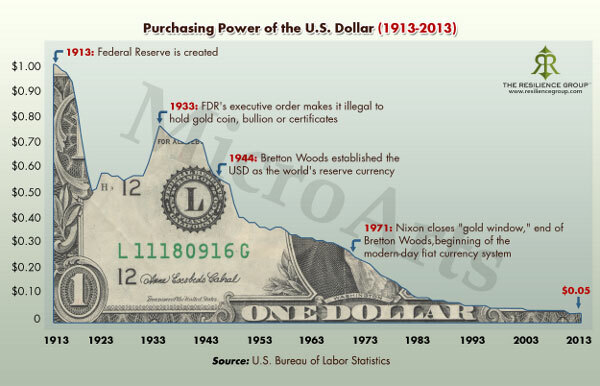 The chart below shows how the US dollar has fallen in value in the last 100 years. The almost universal use of the dollar for trade hides its weakness as a currency. The other economic goal is to set up a development bank from which countries can borrow without going to the IMF or the World Bank. Why would they want to do this? Why are the IMF and the World Bank So Bad? None of these policies do anything to improve the lives of ordinary people. They undermine the domestic economy and are in effect attacks on the sovereignty of these countries. This is why they must be forced on them. Countries either adopt the suggested policies or they do not get the loans. In 2013, during the fifth BRICS summit in South Africa, the member countries agreed to create a global financial institution to rival the western-dominated IMF and World Bank. In July 2014 at the BRICS 6th summit in Brazil, the BRICS set up the US$100 billion BRICS Development Bank and a reserve currency pool worth another US$100 billion. Australia was asked to join, but declined. Who Benefits from IMF Policies? These policies do not come out of thin air. It is important to realize that these policies come from institutions working for overseas investors, investors who do not live in the countries which are expected to adopt these policies. These investors want to pay as little in taxes as the can. Does the health and education of the population in a country asking for a loan matter to them? Do they want these governments to borrow heavily and resort to higher taxes to pay back these loans? Do they want to pay for large government burocracies with higher tax rates? Do they want rules which limit their trade and investment plans? Since they want to invest in infrastructure projects and basic services like water, telecommunications, etc. won't they want these privatized for them? Do they really want higher living standards which come with higher wages? Looking at these policies it is clear that they have only one purpose: to increase the profitibility of and opportunities for overseas investment in a given country. These are the 14 Commandments of International Investors. You might notice that most (all?) of these IMF policies are the same as those pushed by Abbott government. However both state and federal Labor governments have adopted many of these policies as well. What this means is that the policies which must be forced on "third-world" countries are voluntarily adopted by Australian politicians. Our political elite of both major parties treat the economic policies of the IMF as the only possible future for our country. Unlike Australian politicians, the BRICS countries do not treat the dogmas of the IMF as sacred economic commandments. Most people in Australia do not realize that the reason why the "underdeveloped" countries are in such poor shape is that these important Western financial institutions and the multinational companies they work with are really predators, sucking the money out of these countries. This guarantees they can only become poorer, never richer. By adopting the TPP, our politicians will be giving these vampires a free hand to loot and destroy Australia, just as they have done to the rest of the world. Australia's time as a "lucky country" will be over if we join the TPP. While we hear little about the BRICS in our media, we hear nothing about the Shanghai Cooperation Organisation, which is the growing military side of the BRICS. This group, founded in 2001, plans to expand its membership. The most visible part of the military side of this conflict is the current hostility between the US led NATO and Russia, the political leader of the BRICS. In our media the whole blame for the warfare and tension around the Ukraine is placed on Russia. For example, our media does not recognize that there is a plausible alternative account of the crash of MH-17 that does not involve the Russians or the separatists in the Donbass. In August 2014 the New Straits Times, Malaysia’s flagship English-language newspaper, published an article which claimed "the US- and European-backed Ukrainian regime in Kiev shot down Malaysian Airlines flight MH-17 in east Ukraine." Because the media in Malayasia is supervised by the government, we can infer the accusation Kiev shot down MH-17 is in effect an official announcement of their position. (10) Do we hear about this in Australia? Are they going to "shirt-front" Putin? Tony Abbott said his position on MH-17 was a "captain's call". It was nothing of the sort. It was dictated by the US as part of their campaign against Russia. One important consequence of this conflict is to undermine the extensive economic cooperation between Germany and Russia. As part of the US inspired "sanctions" against Russia, Germany has been forced to slow or stop extensive investment in Russia. How is this related to the two economic blocks noted above? The US wants to keep the EU, and Germany in particular, in the TTIP block, and hinder any cooperation with Russia and China. An anonymous blogger explains that the conflict in the Ukraine is "to only fulfill one purpose: to separate Russia from Europe, to prevent Russia from trading with European countries, but above all – to get rid of Europe’s energy dependence on Russia. "(11) Here we see the US policy of forcing the EU countries to purchase energy using US dollars rather than buying energy from Russia in rubles. What Does this Military Conflict Prevent? What would such economic cooperation look like? Both China and Russia have a plan to develop a Eurasian economic zone. China has spoken of a New Silk Road running from Lisbon to Shanghi. This would include new freight and high-speed passanger rail networks, together with gas and oil pipelines from Russia to China, from Iran through Pakistan to China and India, and from Russia to India. Until now only the edges of Eurasia have been developed, mainly through sea based transportation. The Russian/Chinese model is to build a network of rail links and pipelines connecting the main countries like the EU, Russia, India, Pakistan and China and develop the vast interior of Eurasia as well. Such a massive increase in rail networks would be similar to the rapid expansion of the railroads in the UK and the USA in the 19th century, but on a much larger scale. With the EU economy dead in the water, this would be a huge area for investment and development for the EU, Russia, India and China. Furthermore the Chinese, Indians and Russians have cash and gold, while the US and the EU are heavily in debt with a very unstable financial system as we have seen above. How could the US prevent such "natural" economic development? The conflict in the Ukraine provides the perfect excuse to block German cooperation with Russia and China. But why would Germany agree to have its economic prospects ended in this way? The simple answer is that the political elite in Germany are just as fully under the control of the US as the political elite in Australia or the UK. Recently there have been signs that France and Germany might be taking a more independent path, but so far the fundamental situation has not changed. Unlike Australia, Germany and France have large industrial and hi-tech companies which would benefit from such cooperation with the New Silk Road. One of these is the conflict in Syria and Iraq. Saudi Arabia, Israel and Turkey, guided by the US, have organized and funded what are basically mercenary armies disguised as religious fanatics to undermine and destroy the Syrian and Iraqi governments. Why? First Syria and Iraq are allies of Iran which for years has defied US control. Iran wants to sell its oil and gas to China, while the US wants to control the energy sold to China and others so they need US dollars to purchase energy. Second Syria occupies an important geographical position between the energy sources to the east and south and consumers in the EU. If the US could control this region they could control these energy supplies. Finally, Syria is a Russian ally. Removing the present regime would weaken both Russia and Iran, which has so far refused to allow itself to be controlled by the US. But Syria is itself only one part of a grander plan. If you look at the map of Europe, the Mediterranean coast, and the Middle East you can see that virtually all of the countries in Western and Eastern Europe that were part of the Soviet block are controlled by the EU, a puppet government of the US. All countries around the Mediterranean coast are under US control except Egypt, Lebanon, Turkey, Syria, Iraq and Iran. So how does the TPP in Australia fit into this global strategy? The US/EU face an economic challenge by the BRICS block. They want to engage in trade based on local currencies rather than the US dollar. They also want to set up a development bank that is independent of the 14 standard demands of the IMF and the World Bank. Both of these policies pose a serious threat to the US economic and political dominance. The Chinese clearly want to "de-Americanize" the world, and Russia wants to see a "multi-polar" world. To combat this threat, the US has used the TPP and the TTIP to bind its "client states" into a rigid investment structure which gives special powers and privileges to its 600 largest corporations. At the same time it has engaged in open and/or covert subversion of the Ukraine to block EU investment in Russia and Russian supplies of energy to the EU. It has worked to undermine the Syrian and Iraqi state and gain direct or indirect control over energy sources in the region and potential routes for pipelines. The ultimate purpose of these military moves in the Middle East is to insure that energy supplies to the EU and China are paid for in US dollars. Where Does this Put Australia? The realization of the increasing military cooperation between Russia and China puts Australia in a rather strange position. While the Abbott government wants trade deals with China, we play host to US military bases which would be used in any attack on China. Our government and opposition also take part in the US attacks on Russia, the leader of the BRICS. Meanwhile Obama continues to describe China as the greatest threat to peace in Asia. The rise of the economic and military power of the BRICS countries has created a massive geopolitical change taking place right under our noses. As the US fights to preserve its dominant position and the BRICS work to develop an alternative, Australia has a foot in both camps. Our two best friends are actually mortal enemies, and our enemy Russia is best friends with our best friend China. Is this a sustainable foreign policy? The TPP is a disaster in itself, but it is part of a far larger and dangerous power play by the US which could drag Australia into a global conflict with countries of the BRICS block. Do our leaders have any idea of what they are leading us into? Do they really believe that the US empire will last forever? When the Big Boys start throwing nuclear missiles around, where do they think we can hide? 5. The countries in the TTIP from the EU are: Austria, Belgium, Bulgaria, Croatia, Republic of Cyprus, Czech Republic, Denmark, Estonia, Finland, France, Germany, Greece, Hungary, Ireland, Italy, Latvia, Lithuania, Luxembourg, Malta, Netherlands, Poland, Portugal, Romania, Slovakia, Slovenia, Spain, Sweden and the UK. 7. Some sources on problems with the IMF are: http://www.economicshelp.org/blog/glossary/imf-criticism/, http://www.globalexchange.org/resources/wbimf/oppose, http://www.pbs.org/wgbh/pages/frontline/shows/crash/imf/. 12. http://thesaker.is/seven-countries-in-five-years/; text modified slightly from an imperfect translation.